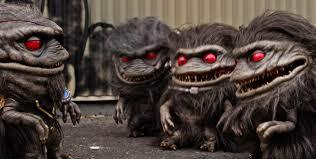 Despite being seen by many as a Gremlins ripoff (even though the initial script was written before the hit film went into production), Critters has amassed a cult legacy. The fandom has been will fed in recent months with the announcement of a Shudder-exclusive series and a secret film coming from Syfy. While details are still scant on the latter project, the streaming platform has revealed Critters: A New Binge. Although the series maintains some of the camp elements of its predecessors, it doesn’t capture the same B-movie magic. The show follows the titular Critters on a return trip to Earth in search of a comrade who was left behind years ago. Hunted by intergalactic bounty hunters, the pint-sized creatures crashland in the hometown of Christopher (Joey Morgan), a teen struggling to fit in thanks to his eating habits and his mother’s (Kirsten Robek) sexual reputation. When the two worlds collide things quickly get out of hand, spiraling ever deeper into outlandish territory by the episode. From the opening minute A New Binge doesn’t take itself too seriously, to its advantage. Poking fun at the bad CGI in a film they are watching en route to Earth, the Critters crew is openingly acknowledging the show’s biggest shortcoming; terrible CGI and green-screen effects. Knowing this, it leans into the comedy aspects of the franchise, littering the script with as many jokes as there are scares. However, those jokes don’t often land. There are outdated references to The Matrix and the first Mission Impossible movie that feel like your dad trying and failing to stay relevant. When the script does crib from a more recent film, the execution can still manage to be embarrassing. The more low-brow, gross humor typically garners a reaction – there’s something inherently amusing about watching the little fuzzballs throw an insult at someone. Then the second half of the series features a plot turn so wild that it’s difficult not to laugh at the fact that it’s committed to the bit so wholeheartedly. While most of the cast is serviceable given the material they have to work with, Joey Morgan and Bzhaun Rhoden stand out from the crowd thanks to a jovial commitment to their characters’ friendship. Both of the young actors exude a natural and infectious joy as they amp up around each other. The show wisely spends a majority of the opening episodes with the pair letting their chemistry carry most scenes. Putting aside the actual content for a second (which is weird to say in a critique of said content), but the oddest and most frustrating aspect of watching A New Binge is the format of the show. It is comprised of eight episodes, each running 8-10 minutes. It’s marketed as a full on television show, but in practice it’s more akin to a web series from the early days of Youtube. The early episodes awkwardly attempt to fit into this structure by offering up closing scenes under the presumption that adding heightened music automatically makes it a cliffhanger. You have to watch the next episode in order to get a sense of narrative satisfaction. The second half of the run thankfully smooths this out, but I was still left feeling that this would’ve been better suited as a full-length feature. With only a couple standout qualities, the latest entry into the Critters franchise won’t have you begging for seconds. It’s an interesting and appreciated experiment, one that Shudder could easily do with another obscure franchise, but let’s hope the next endeavor has a bit more substance. Hailing from Austin, Texas Jonathan was raised on an unhealthy dose of video games and movies. Considering his favorite movies are the odd mixture of Halloween, Aladdin, and The Social Network, he’s learned to approach every film with an open mind. He strives to find the middle ground between film snob and the casual viewer.